It lightly, without stickiness, absorbs into the skin and makes it look fresh. It helps with keeping your skin healthy by containing a great moisturizer, Sodium Hyaluronate and a natural moisturizer, Trehalos. Also, it supplies nutrients and makes your skin smooth with ingredients such as Lavender extract and other flower complexes. 1) After cleansing, apply an appropriate amount of Blooming Essence and evenly massage it into your face. 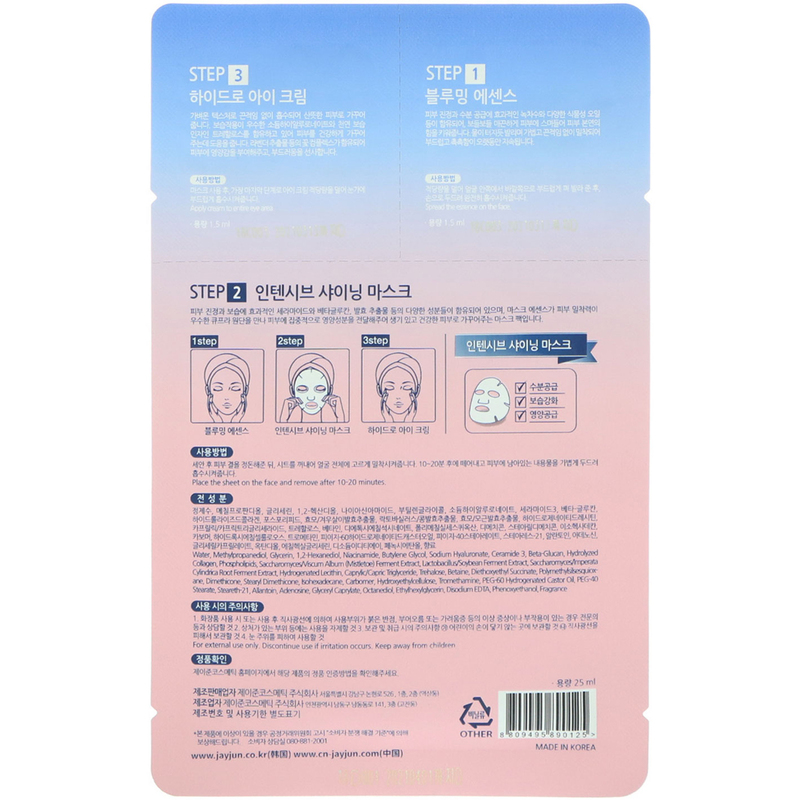 2) Take out “Baby Pure Shining Mask Sheet” and apply it evenly across your face. 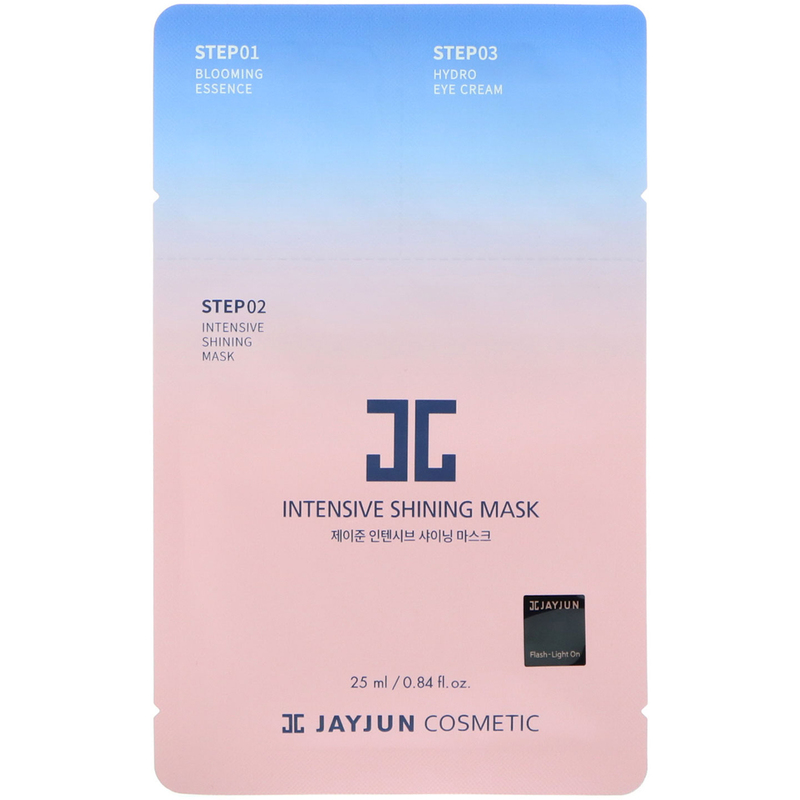 Peel mask from face after 10 to 20 minutes and gently pat the left over essence onto your face. 3) Apply Hydro Eye Cream afterwards. Purified water, glycerin, dipropylene glycol, adansonia digitata seed oil, olive oil, cananga odorata flower oil, rosmarinus officinalis (rosemary) leaf oil, lavender oil, pelargonium graveolens flower oil, pinus sylvestris leaf oil, melaleuca alternifolia (tea tree) leaf oil, green tea water, butylene glycol, sodium hyaluronate, colostrum, lavandula angustifolia (lavender) extract, nelumbium speciosum flower extract, lilium tigrinum extract, cymbidium grandiflorum flower extract, vaccinium macrocarpon (cranberry) fruit extract, rosa damascena flower water (rose water), chamomilla recutita (matricaria) flower water, everlasting flower water, calendula flower water, moringa oleifera seed oil, tocopheryl acetate, disodium edta, polysorbate 20, carbomer, tromethamine, phenoxyethanol. Purified water, methylpropanediol, glycerin, 1,2 hexanediol, niacinamide, butylene glycol, sodium hyaluronate, ceramide 03, beta-glucan, hydrolyzed collagen, phospholipids, saccharomyces/viscum album(mistletoe) ferment extract, lactobacillus/ soybean ferment extract, saccharomyces/imperata cylindrica root ferment extract, hydrogenated lecithin, caprylic/capric tryglycerides, trehalose, betaine, diethoxyethyl succinate, polymethylsilsesquioxane, dimethicone, stearyl dimethicone, isohexadecane, carbomer, hydroxyethylcellulose, tromethamine, peg-60 hydrogenated castor oil, peg-40 stearate, stearate-21, allantoin, adenosine, glyceryl caprylate, octanediol, ethylhexylglycerin, disodium edta, phenoxyethanol, fragrance. Purified water, dipropylene glycol, glycerin, isohexadecane, triethylhexanoin, cetearyl alcohol, glyceryl stearate, pentaerythrityl tetraethylhexanoate, shea butter, theobroma cacao (cocoa) seed butter, trehalose, sodium hyaluronate, hovenia dulcis fruit extract, portulaca oleracea extract, rosmarinus officinalis (rosemary) extract, jasminum officinale (jasmine) extract, lavandula angustifolia (lavender) extract, sciadopitys verticillata root extract, tocopheryl acetate, peg-40 stearate, palmitic acid, dimethicone, peg-100 stearate, sorbitan sesquioleate, stearic acid, carbomer, tromethamine, butylene glycol, disodium edta, phenoxyethanol, fragrance.